On December 4, 1986, United States Attorney General Edwin Meese III requested that an independent counsel be appointed to investigate Iran-Contra matters. On December 19, the three judges on the appointing panel named Lawrence Walsh, a former judge and deputy attorney general in the Eisenhower Administration, to the post. Of the 14 persons charged criminally during the investigation, four were convicted of felony charges after trial by jury, seven pleaded guilty either to felonies or misdemeanors, and one had his case dismissed because the Administration refused to declassify information deemed necessary to the defendant by the trial judge. Two cases that were awaiting trial were aborted by pardons granted by President Bush. As this report explained earlier, many persons who committed crimes were not charged. Some minor crimes were never investigated and some that were investigated were not solved. But Independent Counsel believes that to the extent possible, the central Iran/contra crimes were vigorously prosecuted and the significant acts of obstruction were fully charged. Ultimately, Walsh brought charges against employees of the National Security Council (NSC) staff, the Department of Defense, the Department of State, and the Central Intelligence Agency, as well as against a number of private individuals. In 1992, President George H.W. Bush preemptively pardoned Secretary of Defense Caspar Weinberger at the same time as he pardoned five other figures in the controversy. 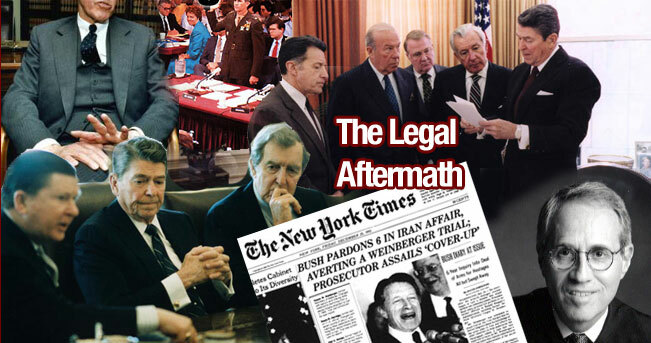 The Independent Counsel's job was complicated by the investigations conducted by the congressional Iran-Contra committees. As Walsh recalled, “No adverse factor shaped or constricted [my] investigation more than the congressional immunity grants” made to a number of key government officials in return for their testimony. Although Congress offered these grants because of the need to understand a scandal in the executive branch and to address a crisis of confidence in the government, this led to the reversal of NSC staff member Oliver North and National Security Adviser John Poindexter's convictions. The Court of Appeals reversed their convictions because they successfully argued that witnesses in their trials might have been affected by publicized immunized congressional testimony, even though the prosecutors themselves had taken painstaking efforts to avoid encountering information about the hearings. The other major problem facing Walsh and his team was the possibility of “graymail,” a problem most acute in the trial of Joseph Fernandez. Under the Classified Information Procedures Act, intelligence agencies may decline to declassify information even if the defense and presiding judge deem it necessary to conduct a fair trial; only the attorney general can overrule their decision. If relevant information is not declassified, the case must be dismissed. In this section, you can find information on Walsh's investigations, both those that led to criminal prosecutions and those that did not, as well as information about President George H.W. Bush's pardons. The charts provide key information about the possible crimes committed and the result of the investigations; by clicking on a name, you can find a more elaborate history of that case.